I know it may seem we are a little deep in the depths of winter to be thinking about next year’s gardening season. But this is the perfect time of the year to think about how you are going to get the freshest produce for your family next year. May I suggest a simple, local, and nutritious idea? 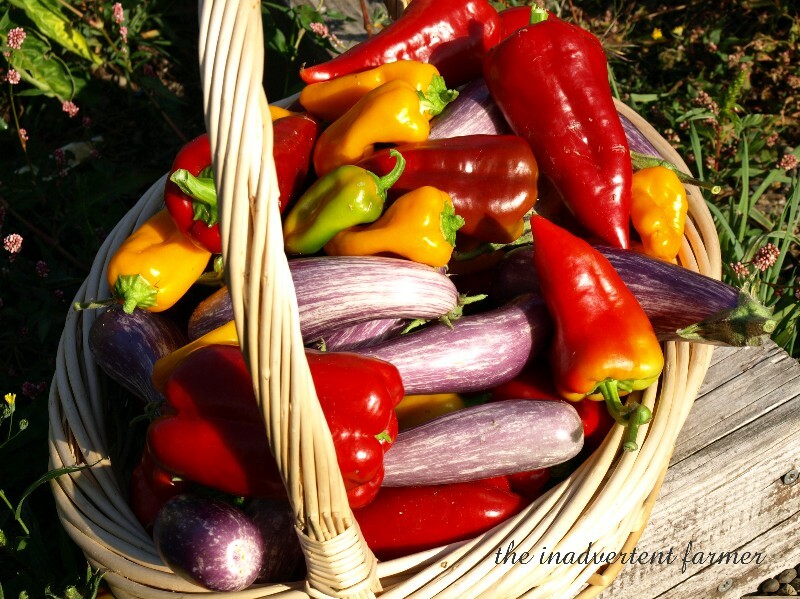 Give your local Community Support Agriculture (CSA) a try! If you do not have the room, the time, or the inclination, for a garden your local CSA is a great alternative to grocery store produce…which travels an average of 1500 miles before coming to your local store! A CSA works as a partnership between a local farmer and the community. A family buys a share of a farmer’s crop for the entire growing season. Early in the year (usually January – March) each member puts down a deposit for his share of the harvest. When the first harvest is ready the farmer contacts his shareholders to let them know that the season has begun. Each week throughout the growing season each member’s share of fruits and veggies are boxed or bagged up for member pick up. What is offered at each pick-up will vary by the the season…like a surprise package each week! The popularity of CSAs has been growing stronger each year as consumers are trying to avoid produce that has been shipped across the country (or world)…the desire for local and fresh has grown so strong that many CSAs fill up so quickly that you must sign up the first week shares go on sale! When you are part of a CSA you make a connection with the farmer and other community members…you get to know the person that actually grows your food! With that you gain an appreciation for what it takes to grow the food…something that we just don’t think about when we pick up something from the produce aisle of the grocery store. Many farmers offer newsletter that let their members know how the harvest is going, what is coming up each week and share recipes for using that weeks produce. Meeting and visiting with fellow members on pick-up day is also a great way to get ideas and share recipes and tips for using seasonal produce. Growing method. Does he/she use organic growing practices (realize that many that are organic farmers are not ‘certified’ as this process can be quite expensive and time consuming…with money and time both being precious commodities for small farmers many have not gone through with certification yet practice organic methods. Fee. You can find each CSAs fee by checking its Web site or calling. Always ask what the fee covers and how much produce you can expect to receive. You might also be able to buy 1/2 a share if you are a small family or you can go in with another family. Pick-up location. Since you will be picking up a box every week for many months make sure the pick-up sight if convenient…or consider sharing pick-up duties with another member, trading off week to week. Foods Grown. Before decided on a CSA ask what type of produce they grow and what is to be expected throughout the season. Each farm has a different variety of fruits and veggies and many change from year to year. Add-ons. Sometimes CSAs offer things like fresh cut flowers or herbs. Some offer extended seasons. Make sure to ask your local farmer about his add-ons to the regular share. What-ifs. Since the weather is so closely tied to each growing season, make sure to ask what if a crop gets wiped out by hail. What happens when the tomatoes are wiped out by blight? Some farmers work with other farmers to get the missing produce, some substitute other items for those lost. To find a CSA you can go to localharvest.com, ask at your local health food store, ask at the local farmers market if any of the farmers there offer CSA shares, or look for signs in your community. It may be winter but that doesn’t mean we can’t think ahead to juicy tomatoes, crisp cucumbers and sweet bell peppers. If you want the freshest local fruits and vegges without the work…consider Community Supported Agriculture! Merry Christmas! Check out my gift! Merry Christmas! 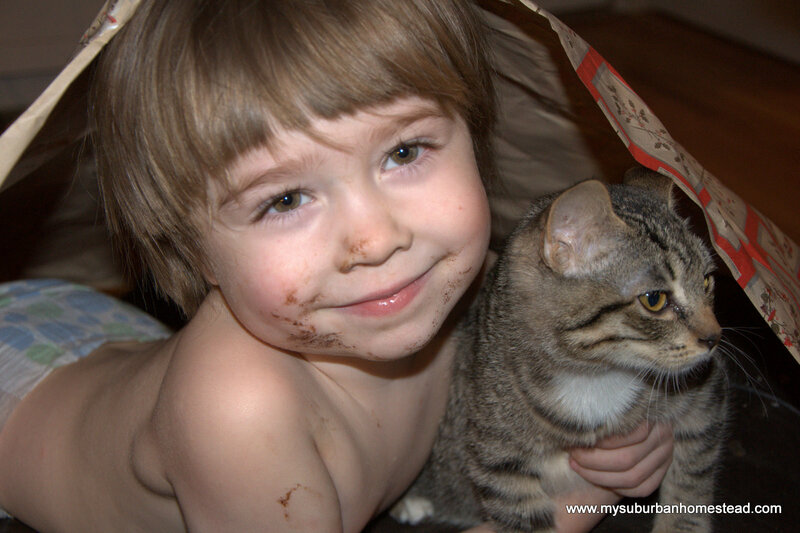 This is my sweet, chocolate-faced boy, playing with gift wrap and his new best friend, our kitten. Hope you all are having a wonderful holiday! 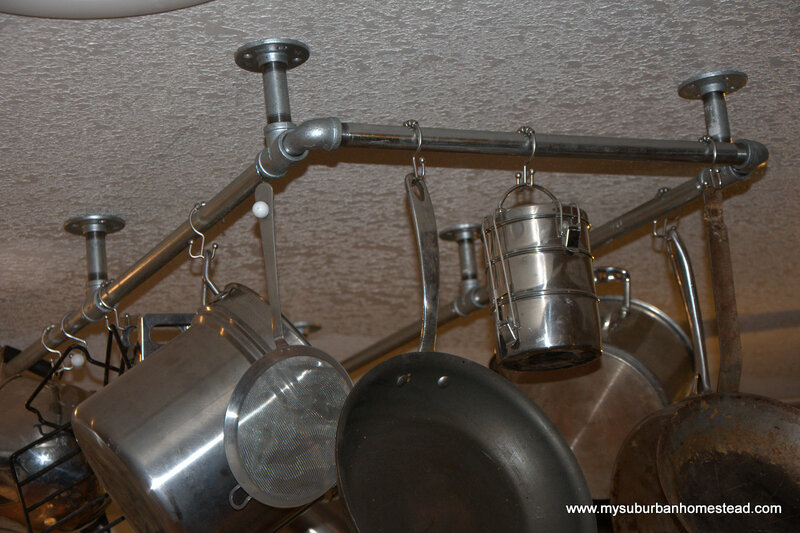 My husband made me this awesome homemade pot rack. It’s made of galvanized piping, which he picked up at Home Depot. It’s huge (roughly 4×2′)! We only have an 1,100 square foot house so we need to be quite creative in our storage solutions. The hooks are just some shower curtain hooks which have a loop on the end. Our house was built in the 70’s, so we have very low ceilings. 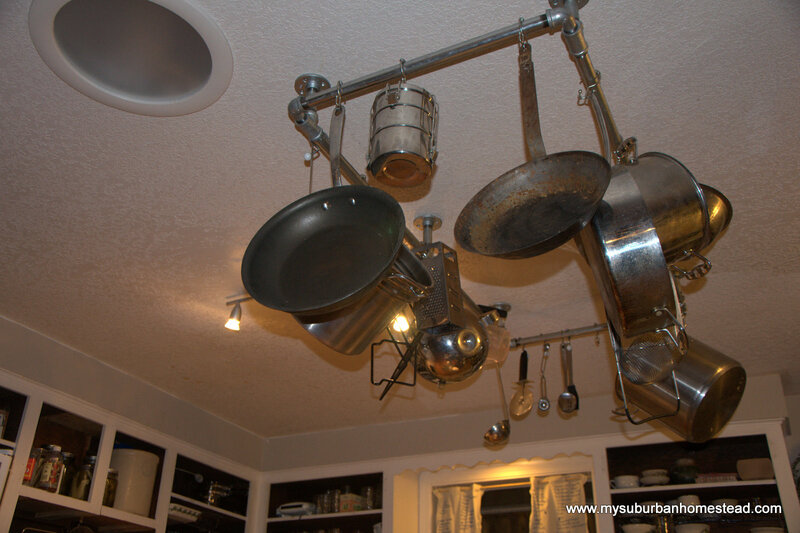 I’ve attempted a different pot rack before this one, but the pots hung so low that they hit me in the head all the time. Here is a link to my husband’s blog, which has more details about the construction and a list of materials should you like to make one of these yourself. He told me this cost around $100 to make. 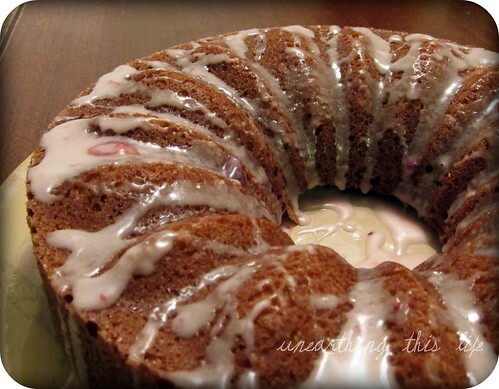 This post was written by Amy who writes the blog My Suburban Homestead. Here at Chiot’s Run I like to be prepared by keeping a few little gifts on hand for last minute holiday parties or surprise guests. If you’re in need of a quick hostess gift or something for a gift exchange a mix of mulling spices in a pretty jar is a great option. They can be used for cider and wine. This year I decided it would be my gift of choice for friends & holiday parties. This is super quick and simple to make, as long as you have all the spices on hand, which I always do. You can even customize it to the person you’re giving it to or to your own tastes. I use the same recipe for these jars as I use for my own cider. I keep all of the organic spices on hand since I buy in bulk from Mt Rose Herbs. The vanilla beans I get very inexpensively from Saffron.com. I don’t like the flavor of citrus in my cider, if you do feel free to add orange peel. You can also add dried ginger chunks or nutmeg if you like, use what you’ve got on hand and what you like to use. I have a few other ideas for quick gifts over on my blog today in case you’re interested. 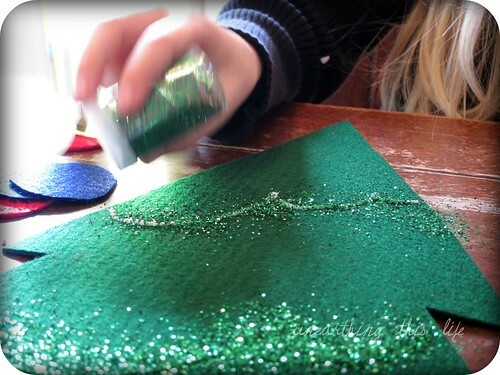 Do you have any great quick last minutes gifts that you make to keep on hand? Here at Chiot’s Run I have so many favorite things (which I blog about every Friday). Here are a few that are particularly relevant right now: watching the birds flit about at the feeder, listening to my collection of Christmas music, seeing my grandma’s button collection on my shelf, baking up a storm of delicious holiday goodies, and looking at the Christmas lights with squinty eyes. What are are a few of your favorite things? Just wanted to let you all know that I received an e-mail with a 1 day coupon from Peaceful Valley for $20 off of $100 order (expires at midnight). I’ve priced their supplies many times in the past and they consistently come in the cheapest, so this is a crazy good bargain! If you need anything for the garden, this would be a great time to get it. I blogged about this yesterday over at Simple Green (not sure how many of you read over here as well), but I thought it would be great here as well. Not to mention I’m super busy making gifts for Christmas without much time left for blogging. Sorry to those of you who read both blogs. I’m always game to save money in any way I can. Gift wrapping can be very expensive, even if you buy it on sale after the holidays, and buying something that you’re just going to recycle and throw away seems a little crazy. One inexpensive way to wrap gifts is by using brown kraft paper. You can buy it in big rolls very inexpensively at home improvement stores, but I find that if I save the stuff that comes in packaging throughout the year, I never have to buy any, in fact I always have a pretty good sized stash on hand. Not to mention I’m able to reuse something before it goes into the garden (we always compost kraft paper products instead of recycling). The paper is usually crumpled, so I crumple it even more to give it some texture (and to make it look intentional). I love using kraft paper because it goes with just about any kind of decor and it’s not gender, age or holiday specific. You can adorn any way you like if you want to add some pizazz. I have a box of saved ribbon in the basement that I occasionally use, especially if wrapping a birthday gift. I find that garden twine works well and looks lovely, especially if you include a little natural element like a pine cone or pine sprig. 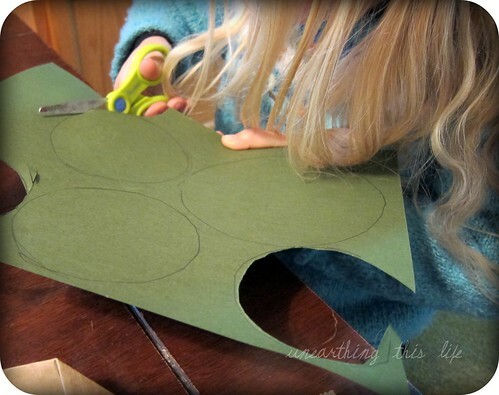 All those little scraps of yarn work as well, you could also use scraps of fabric, paper or just decorate with markers. You can also save those brown paper bags that you get throughout the year to use as wrapping. I have a stash of all shapes and sizes from very tiny to fairly large. 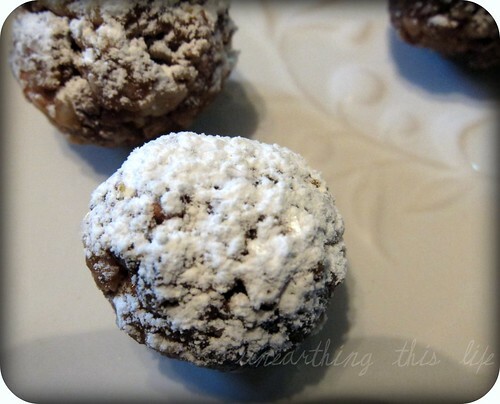 These are fabulous because they’re quick and easy! I usually punch holes in the top and use a twig or a piece of ribbon to close it. I think a stick of peppermint would nice as well or maybe a pencil or something useful. This is a great frugal way to save on wrapping expenses and to keep extra things from being produced and purchased simply to throw away or recycle. I find that when I gift a gift wrapped this way, people tend to stop and take notice. Perhaps it will make them consider doing the same the next time they have to wrap a gift. What kind of wrapping do you use in your household? Any great ideas for saving money in this area or for creative wrapping options?